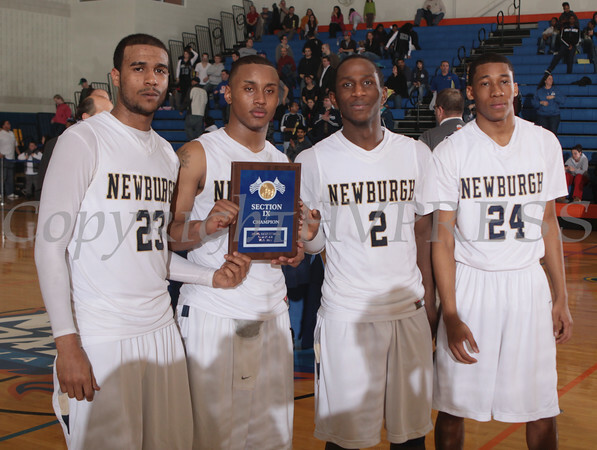 Newburgh Free Academy Goldback's Will Williams (23), Jarrod Scurlock (5), Antonio Harper (2) and Brandon Clark (24) hold the winning plaque after the Section 9 Class AA championship game at SUNY New Paltz on Saturday, March 5, 2011. NFA defeated Middletown 54-41. Hudson Valley Press/CHUCK STEWART, JR.